The Ducks have been bi-polar this season: losing streaks of 3 and 2 preclude two 4-game win streaks. There have been two waves of new player arrivals this summer. The first to start the season and the second after the Warriors game. In both instances it took some time for the flock to come together, for that oft-spoke-of, intangible, all-important “Chemistry” to manifest, to become something palpable and real we could wrap our wings around. We’re beating on teams now, two consecutive ten-run rule victories over division opponents. Last night the hitting was contagious, the defense was steady and Mark [Captain “Last thoughts on Woody” America] Guthrie turned in another solid outing to raise his record to 2-2, and lower his era to 1.37. TC Jones recorded an RBI single in the 4th and is batting 1.000 against Adam Smith for his career, while striking him out once in the first Ducks/Eagles’ game this season. The grudge match, which probably means more to me than either of those two, makes for solid blog post material. Essentially, Smith left the Ducks because he disagreed with TC’s managerial style. Smith has not defeated the Ducks since leaving the team, the Eagles are 4-7, while the Ducks are 8-5 and in first place. The Ducks have outscored the Eagles 24-5 over two games. TC Jones has the 3rd highest winning percentage over two years of any Pittsburgh NABA manager. : 14-12-2, and then 16-8 for a 30-20-2 record. The coach with the highest winning percentage over two consecutive seasons is also a Duck. No idea who #2 is, and I’m not going to look it up. My all-time record as coach is not good, but it’s improving. The Ducks play the Titans on Sunday at 5:30 at Ohio River Blvd. Field, the Knights at 9pm next Monday night, then, after a week off, Ducks vs. B-Sox at the Pond. Bring on Kenny Powers and the Fightin’ Florians. 6/28 9pm at Spring View. That’s the game we have to have. Guthrie allowed the only Eagles hit of the game with two outs in the first. Then, after an error, he K’d Adam Smith to end the inning. Five walks surrounded DeFilippo’s rbi single, Nick Homa followed Chris Wojton’s rbi base-on-balls with a two run single. Guthrie puts the Eagles down in order in the second, and the Ducks sent nine batters to the plate in the second. Mike Duffy is batting .437; he led the inning off with a single, stole second and scored on DeFilippo’s second hit of the game. Nick Berdine followed Flip’s single with an RBI triple to right, and scored on Lipp’s single to center. Adam Smith entered the game as a relief pitcher at some point. Guthrie faced three batters in the 3rd. Gwin finally got a hit, singling to lead off the bottom of the 3rd, the first of two on the night for the arthritic catcher. Duffy followed with a single, Rob Cool did not get a hit, then Casale hit one up the middle which was thrown away by Smith, loading the bases for Defilippo who drove in another run with his third hit on the game. Then TC “Boyle” Jones stepped to the plate with Casale on third and Drop City’ed a 1-2 pitch into left for the Ducks’ 11th run. The Eagles were Baconated in the top of the 4th. 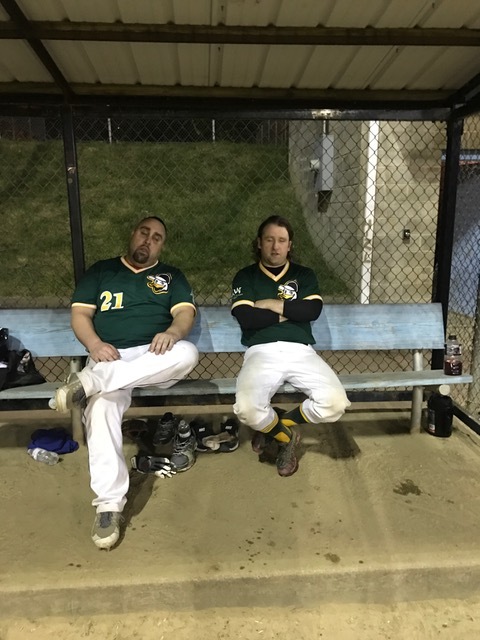 The Ducks added 3 more runs in the bottom half: “Slick” Rick Whalen and Murphy walked to open the inning, Gwin singled to right, and Whalen scored on a throwing error, that I probably credited as an RBI for myself because I have no respect for the sanctity of pgh naba baseball. Guthrie walked to load the bases. Flip drove in Gwin with a fielder’s choice. 3 for 4, 3 rbi, 2R. Tessyier pitched the 5th: three up three down.